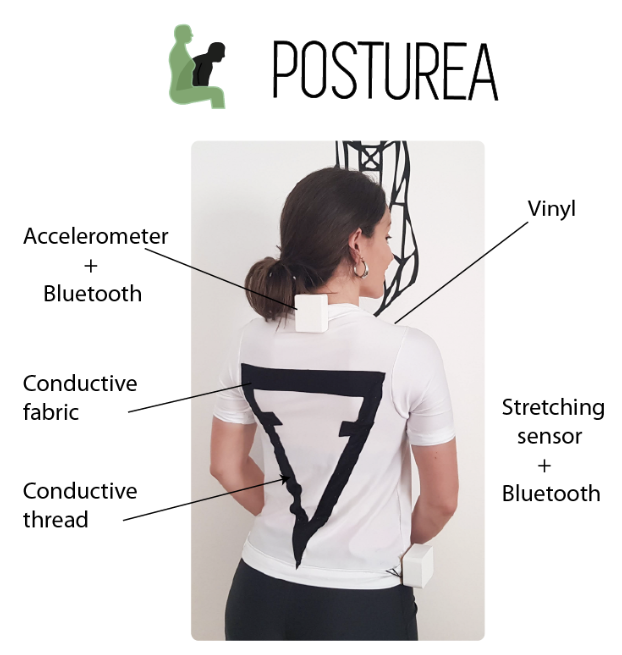 Posturea is a poster that measures the inclination angle of the body (Accelerometer) as well as excessive stretching of the shoulders (conductive thread) to check whether the subject is a good position. A poster corrector has been created as the final project. Accelerometer board that will be placed on the neck to measure the inclination angle with a Bluetooth that will be able to communicate with a phone app. Vibration motor included in the accelerometer board that will send a vibration output whenever it measures a bad inclination. Conductive thread on a t-shirt that will measure how the muscles are being stretched. The board to read that thread with a Bluetooth to also communicate with the phone app.